Gerður KRISTNÝ (fiction writer, poet; Iceland) is the author of five poetry collections, two novels, nine books for children, a travelogue and one biography. Widely awarded, her work has been translated into 21 languages. In 2011, the musical [The Ball at Bessastadir], based on her fiction, was staged at Iceland’s National Theatre. 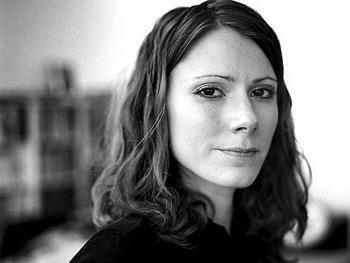 Kristný has worked in broadcasting, and is the former editor-in-chief of a literary monthly. What are the most curious legends about Iceland that you are also proud of? What about a frightened character? Can you compare your national legends with the worldwide ones? We believe in ghosts. We have long and dark winters so it is very easy to imagine that you are not alone. The sound of the wind and the creaking of a door give you the idea that all sorts of scary creatures must be lurking in the dark. These ghosts usually return to the living because they have a job to do and they can’t find peace in the world of the dead. Do you travel with this legacy of your country? Do you create new characters? You write books for children too, not only poetry. I leave the ghosts at home when I travel. When I was at a poetry festival in Indonesia I knew it was only a lizard running around on my roof, not a ghost. I have written ca. 24 books and almost half of them are for children. One of them is called The Cemetery (2008) that was published in Germany, Norway and Denmark as well as Iceland. It is a ghost story that takes place both in modern times and in the autumn of 1918 when the Spanish flue arrived in Reykjavík with ship returning from Denmark. It was a very dark time in Iceland’s history since most of the habitants of Reykjavík caught the illness and most of them died. After the epidemic, people found it very difficult coping with the loss of so many people so they got very interested in spiritualism. People started going to séance meetings to talk the dead. I found that very interesting so I wrote The Cemetery. I think you are one of the most “mobile” writers I have known. You travel a lot, within the whole globe. Does your writing benefit from being in so many places? It sure does. As a fisherman is supposed to bring home fish from his fishing trips I bring home a poem from the poetry festivals I am invited to. I have written about a palace with creaking wooden floors in Japan, the traffic in India, the leafy hills in Uganda, the sunset in Sweden and the white reindeer in Finland. What is the importance of being “on the road”? What is a road for you? What is home or at home in this new light? When I travel I go home to myself—the one I was before having a family. I was invited to a poetry festival in Bangladesh a few years back. The organizers kept asking me to give speeches without any warning. I remember sitting on a stage with a bunch of men in front of hundreds of people, among them the minister of culture and education. Suddenly a man whispered to me: “Now it is your turn!” I whispered back: “To do what?” and he answered: “To give a speech!” So I stood up and gave a very short and spontaneous talk about the festival and my gratitude for being invited—hoping this would never end up on YouTube. During the festival I also got handed three prizes without ever knowing for what exactly. Why is Island different from other parts of the world? From what I know, writers are still perceived like little gods! This is a big question. I am not so sure that Iceland is that different from other parts of the world. We are just 320.000 people living on a volcanic island in the Atlantic Ocean trying to cope. You are also a mother of two children. Does this influence you? Being away and being invited to take part in literary residencies and festivals must be challenging, but you can do both! Yes, my sons influence me. My husband and I wanted to have two children and that is what we got. I consider myself very lucky. And of course I welcome the opportunities life throws at me. It is important to my sons to have happy parents. My friends, who also have children at home, work as film editors and actresses abroad and somehow everything works out. Friends and families help each other out here and the children get to learn early that they are the makers of their own destinies. When you move from one place to another, do you have rituals, habits, do you arrange your work space in a special manner? If I am in a residency I start working early in the mornings and write until 13 o’’clock and then go for a walk. When I was in the IWP, in Iowa City, I always had lunch and visited the public library. I managed to read a lot while I was staying there. In the afternoon I start writing again and until late in the evening. If I am at a festival I never plan anything. Sometimes, there isn’t time to do anything else than read and, maybe, mingle a little bit. I try to look up the names of the other poets and writers to see if I know anybody. I keep bumping into the same people who have become good friends. This winter I have been invited to festivals in Norway, Sweden and Canada, and can’t wait to be on the road again and meeting my colleagues. What would Hilary*1 say about you, today? Hilary is happy, hoping for the best! 1 Hilary is a mascot which was present in the common room of Iowa House Hotel at each of the private reading series and parties, during International Writing Program, 2014. In time, the meetings have been called with this secret code name, Hilary. The poster of Hilary was officialy preserved in G. Kristny`s room and was taken with her to Iceland.